Dr. Pilla is currently involved in the Boeing Space Exploration’s path-finding effort for the NASA human space exploration into deep Space. He previously led the Space Shuttle Integration Engineering for Boeing at NASA Johnson Space Center until the end of the program. As the head of the Engineering Integration team, he provided oversight to the Avionics, Electrical, Structural, Mechanical, and Systems Engineering disciplines, leading to the Certification of Flight Readiness for the Space Shuttle. Prior to this assignment, he was Functional Head for the Structural &amp; Mechanical Analysis Engineering for Boeing Space Exploration, where he provided oversight to the Space Shuttle, International Space Station (ISS), and Constellation Engineering teams. Dr. Pilla provided effective leadership to the teams of 100+ engineers and multiple managers, where he was responsible for strategic business and technical planning, executing technology integration, subcontractor management, risk management, and employee development. 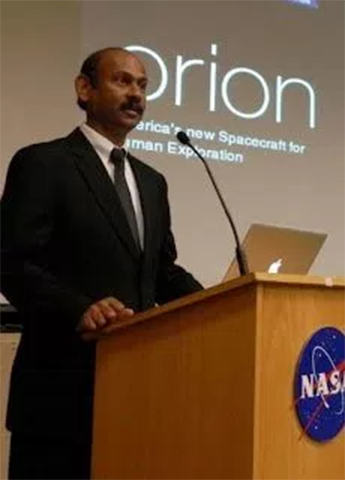 Some of Dr. Pilla’s major contributions include – leading the reconfiguration of the Structural Integrity Analysis Process for the ISS prime structure for new flight attitude assessments, and guiding the Flight Reconstruction Loads &amp; Dynamics Analysis for the Space Shuttle Columbia accident investigation effort. Dr. Pilla’s inter-divisional accomplishments include leading the Dreamliner (787 -9) section 41 prime structure design optimization efforts at Boeing Commercial Airplanes, and development of Airport Security Architecture Concepts at Boeing Global Security Systems. . Prior to joining Boeing, Dr. Pilla worked in the Advanced Vehicle Engineering at the Chrysler Corporation, where he made pioneering contributions in setting up the Computer Aided Engineering (CAE) processes on the path finding Digital Jeep project. Before that he worked in India as the Deputy Director with the Bureau of Indian Standards and coordinated as the Special Officer for the Quality Assurance on the Technology Missions of the Department of Science and Technology. Dr. Pilla is a visiting professor at Embry Riddle Aeronautical University, and is a member on the editorial board of the International Journal of Engineering, Science and Management. He has several scholarly publications in both engineering and management. Dr. Pilla holds a Masters in Structural Engineering from Rice University, a Masters in Systems Architecture &amp; Engineering from the University of Southern California, a Masters in Business Administration from the University of Houston, and a Doctorate in Management from the University of Maryland. A lifelong practitioner for Quality Improvement, he has Lead Auditor certification from the American Society for Quality (ASQ), as well as a Lean &amp; Six-Sigma Black Belt from the Villanova University. “The earth is what we all have in common.” And we have only this one...act now!